When will the police come for me? Thou shalt not lie with mankind, as with womankind: it is abomination (Lev 18:22). If a man also lie with mankind, as he lieth with a woman, both of them have committed an abomination: they shall surely be put to death; their blood shall be upon them(Lev 20:13). Do not be deceived: Neither the sexually immoral nor idolaters nor adulterers nor male prostitutes nor homosexual offenders nor thieves nor the greedy nor drunkards nor slanderers nor swindlers will inherit the kingdom of God (1Cor 6:9f). Whatever one’s interpretation of the above scriptures, as of today it would be a bold preacher who so much as jokes about homosexuality. Today is the appointed time by our wonderful Government for Section 74 of the Criminal Justice and Immigration Act 2008 to come into force. It creates the new offence of intentionally stirring up hatred on the grounds of sexual orientation. It is not a matter of inciting violence or grievous bodily harm: there are already laws against that. So it is now a crime to ‘intensely dislike’ homosexuality. Or to ‘intensely dislike’ homosexuals. Because the two are so easily confused in the mind of the victim (if not the perpetrator) that the mildest disapproval of the behaviour might be mistaken (or purposely distorted or misinterpreted) as vehement disapprobation to the extent that it becomes an irrational attack upon the person. It is true that the Lords won an important ‘freedom of speech’ amendment, but it will exist only on paper. In practice, the culture will shift towards an auto-self-censorship: people will be so afraid of transgressing the law (or, worse still, of merely being accused of transgressing the law) that the jokes will subside, humour will diminish, drama will avoid the subject and real life will consequently be impoverished. Debates on sexuality will become taboo, not because of a statutory prohibition but because of an impediment to negativity, questioning, accusation and allegation. Did you hear the one about the gay guy who…? Call the police, report the crime. And you can be very sure that the police will treat the allegations with the utmost urgency. God forbid that Her Majesty’s Constabulary might be accused of being homophobic. Nor is this effect accidental. It is intentional. It is intended to chill certain types of speech, to make people afraid to say what they think. It is intended to allow gay campaigners to torment their enemies, to drag them into courts. Not the slightest effort has been made to limit the effect of the legislation. As one minister gloated, the churches had better start hiring lawyers. This too is intentional — Ezra Levant has documented the technique of “lawfare”, of “maximum disruption” where a campaigner is given a legal basis to make as many complaints as he likes, at no charge to himself, against others, to drag them through the courts for months and years, to force them to run up huge legal bills. Normal people may wonder why the establishment is so desperate to force unnatural vice upon us all, to make it a norm, to force us all to speak politely about it. But the answer may be found in Paul Kocher’s Master of Middle Earth, which studied the Lord of the Rings: “It is not enough for evil if its victims do as it wants; they must be forced to do it against their wills.” It is the arrogance of power to choose some evil, detestable to almost everyone, and force all to bow down to it. This is evil. This is a piece of hate, passing laws to permit and encourage and foster attacks by one tiny well-organised section of the community on another which is quiet, law-abiding, and harmless. It is specifically targetted at the churches. Indeed we can be sure that the law was drafted by the gay lobbyists who intend to use it — there’s been enough in the press lately about the way in which Blair simply implemented the demands of Stonewall for some huge list of rights and privileges. Some may say that this all has only a limited bearing on the gospel. But so did sacrificing to Caesar; “a pinch of incense… what’s the harm in that?” asked the atheist Roman procurators. It is a fingerprint. It is intended as a test case. Do you follow Christ, or Caesar? How we oppose this evil I do not know. That we can either oppose it together, or be picked off, one by one, seems certain to me. * Cranmer also quotes a section of the Koran; but we can be sure that the Moslems are in no danger of interference! « An algorithm for matching ancient Greek despite the accents? I think it is a big difference between “intensely dislike homosexuality” and “intensely dislike homosexuals”. I intensely dislike depression, but I don’t dislike a person with depression. I don’t think the law should be concerned with emotions. I don’t care if someone hates me like poison (my manager, for instance); only if they act to injure me. And it doesn’t matter if he acts to injure because he hates me, or because he thinks it right; it is the injury that matters. Anything else is “thought crime” in the Orwellian sense. We can tell a thought-crime law easily enough. In libel, it is a defence that what is said is true. In thought-crime, it is a worse crime if what is being prosecuted happens to be true. I wish we all had the US guarantee of freedom of speech. So not that this is an ideal solution, but does this make you want to leave England? There’s a pair of pretty paradoxes – the pet hatred of your State’s most protected group, Muslims, is now illegal; meanwhile, the “hate-speech” law is itself “hate-speech”. “I wish we all had the US guarantee of freedom of speech.” – Let’s enjoy it while it lasts. “Hate-speech” (sorry for the repeated use of that Orckish phrase) legislation is spreading over here, too. I have certainly expressed in the past my thoughts on the bugger problem, so my headline is not entirely outrageous. But I suspect I am too small fry for the inquisitors. They will now start to create legal precedents by pouncing on carefully selected poor and helpless individuals in the provinces and getting them savagely punished. What I wonder is whether something similar happened to the Romans in the height of their luxury in the 2-3rd centuries. After all, such a thing would leave almost no traces in the literary and archaeological record, while rooting out any loyalty to the state, marginalising the Romans, and destroying Romanitas in the people. Something happens to the Romans between the 1st and 4th centuries which isn’t really explained, and turned them into Italians. 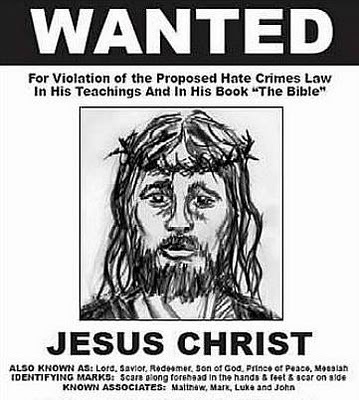 The purpose of such a law is not to stop Christians discriminating against homosexuals, for law-makers know very well that Christianity does not discriminate against them – its purpose is to make Christians change their beliefs; to make them see what they think wrong right. This is not about restricting the freedom of speech – it is about curtailing the freedom of faith. The State is threatening us not even to think or entertain that homosexuality is sinful, morally wrong or unnatural. This is why I intensely dislike such interference from the State. Exactly so. It places Christians in a position where any minor or ill-disposed official can harass them at any time, or demand concessions or whatever from them. Any Christian is fair game, is the message.